Course Overview: If you want to fine-tune your buoyancy and soar over reefs, extend bottom time by reducing air consumption and prolong the life of your dive equipment, the Peak Performance Buoyancy Specialty course is for you. Prerequisites: Must be at least 10 years old and certified as a Junior Open Water Diver or an Open Water Diver. Course Activities: You will learn how to use the Basic Weighting Guidelines to determine the correct amount of weight. Then you will practice the fundamentals of peak performance buoyancy during two open water dives under instructor supervision, including the buoyancy check at the surface, fine-tuning buoyancy underwater, weight positioning for trim, streamlining and visualization. Classroom: There is one classroom session. The classroom session will cover the Peak Performance Buoyancy in the Adventures in Diving Manual, review your knowledge review answers and prepare you for both of the open water dives. Independent Study: Read the chapter Peak Performance Buoyancy in the Adventures in Diving Manual and complete the knowledge review located at the end of the chapter. Watch the entire Peak Performance Buoyancy DVD. You will need to turn in the knowledge review prior to certification or provide a copy of an Adventure Log signed by an appropriate instructor if you have already done dive one in connection with your Adventure Diver or Advanced Open Water Diver Certification. Materials/Equipment Required: The Adventures in Diving Manual. Recommended: The Peak Performance Buoyancy DVD. Length of Course: If you have read the Peak Performance Buoyancy chapter in The Adventures in Diving Manual, completed the knowledge review and watched the entire video prior to coming to class, the classroom session should take approximately 1 hour depending upon class size. Assembly of weight system and use of the "Basic Weighting Guidelines". Getting in the water, buoyancy check and descent. Hovering - If appropriate, establish neutral buoyancy using the fin pivot, then hover for one minute without fin movement or hand movement. During the hover practice breath control to make minor depth adjustments. Ascent - Ascend at a rate not to exceed 60 feet per minute. Vent air as needed from your BCD to maintain neutral buoyancy. Perform a safety stop at 15 feet for 3 minutes. Maintain neutral buoyancy at the safety stop. Post-dive procedures - Signal support personnel once on the surface after a dive (if appropriate) and conduct a post-dive buoyancy check. 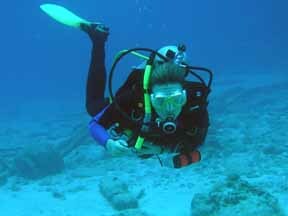 Achieve comfortable positive buoyancy using your BCD. Debriefing - Discuss differences between buoyancy checks at the beginning and end of the dive. Prepare personal diving equipment. Rig weight system, estimating amount of weight using the Basic Weighting Guidelines. Position and distribute the weight for comfort and desired body position (trim) in the water. Visualization practice. 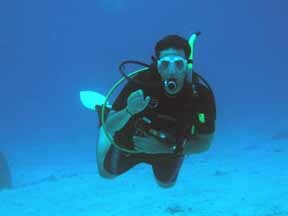 Just before suiting up, take time to visualize yourself attaining Peak Performance Buoyancy while diving. Conduct a pre-dive buoyancy check. During the dive: Demonstrate efficient fin kicks, using long, slow strokes and gliding after each kick. Avoid all contact with the bottom - body and equipment. Practice hovering over the bottom without kicking or hand movement. While hovering, practice making minor depth adjustments using breath control only. Maneuver close to a nonliving portion of the bottom (rock, sand, etc.) without touching it and then back away using neutral buoyancy with hand or fin sculling. Ascent: Ascend at a rate not to exceed 60 feet per minute. Vent air as needed from your BCD to maintain neutral buoyancy. Perform a safety stop at 15 feet for 3 minutes. Maintain neutral buoyancy at the safety stop. Post-dive procedures: Signal support personnel once on the surface after a dive (if appropriate) and conduct a post-dive buoyancy check. 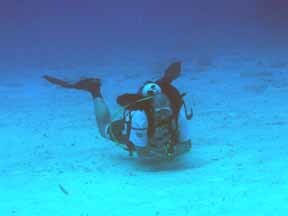 Achieve comfortable positive buoyancy using your BCD.